In February, Studio Ramli Hassan will play host to Argentinian actress Ana Woolf who will be conducting workshops, perform and show a "behind the scenes" work demonstration. Email: masakini_theatre@hotmail.com to book your place for any or all THREE programs! 2 more show on 8th & 9th by popular demand! Email: masakini_theatre@hotmail.com to book your place for any programs! 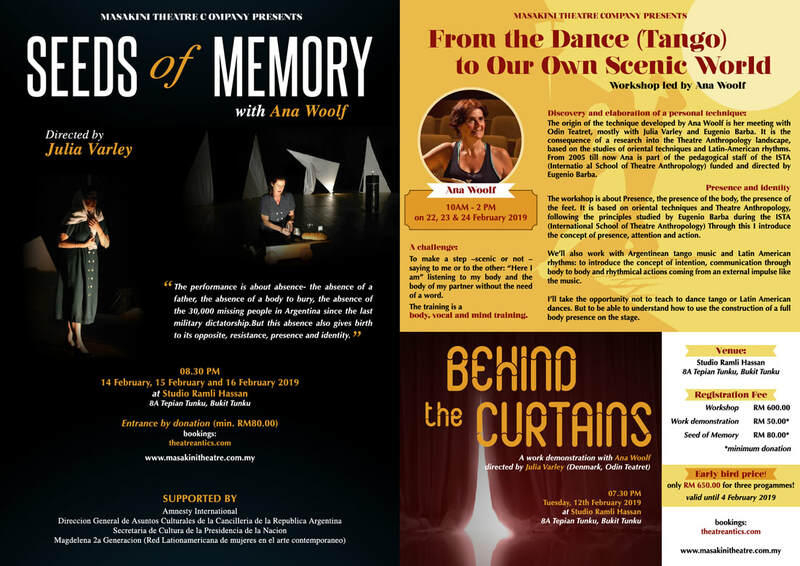 In February Ana Woolf comes to Kuala Lumpur with a performance, Work demonstration and Workshops-all happening in Studio Ramli Hassan. Watch out or this space for dates and times. Join us in our fund raising efforts over two weekends. Choose which lady you would wish to dine or have cocktails with! 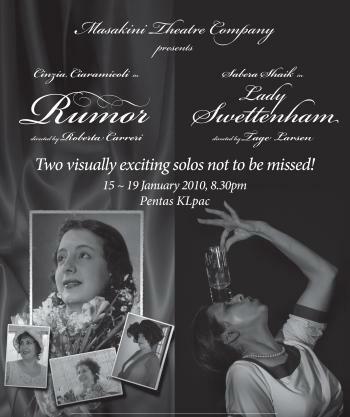 This week-end Lady Swettenham tells her story at Selangor Club where she used to play the piano. an evening of soothing ancient Chinese music played by a talented trio led by Stephano Chen (tenor), Loretta Tan on the Gucheng and Andrew lim on the erhu and pipa. Entrance RM100-you can bank into: CIMB acct 8001359848. 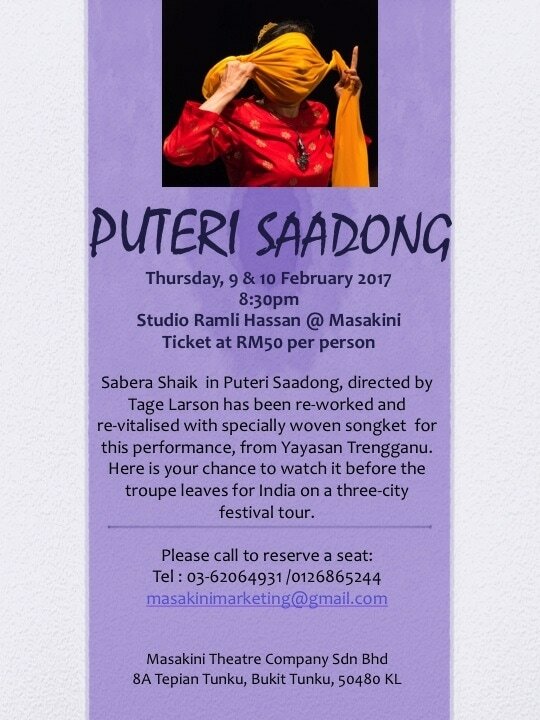 Directed by Tage Larsen, this Puteri Saadong is a complete re-working of the famous Kelantan lengend of a pricess captured for her love and looks. 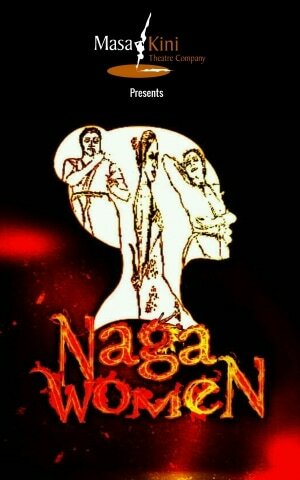 Directed by Tage Larsen, this Puteri Saadong is a complete re-working of the famous Kelantan lengend of a pricess captured for her love and looks. 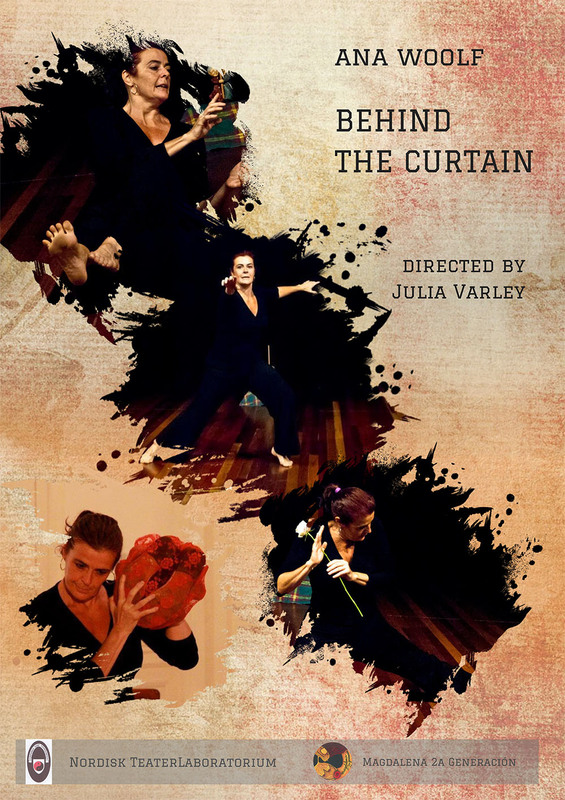 Starring Sabera Shaik, this version is a re-invigorated story of a woman's struggle against the King of Thailand. With new and lush constumes in songket woven by Yayasan Terengganu, this one hour performance promises drama, tears and the eventual win for a true princess. Don't miss this opportunity to watch it before the troupe leaves for India on a three-city tour. Please contact 03-62064931 / 012-6865244 or email to masakinimarketing@gmail.com for your ticket reservations. 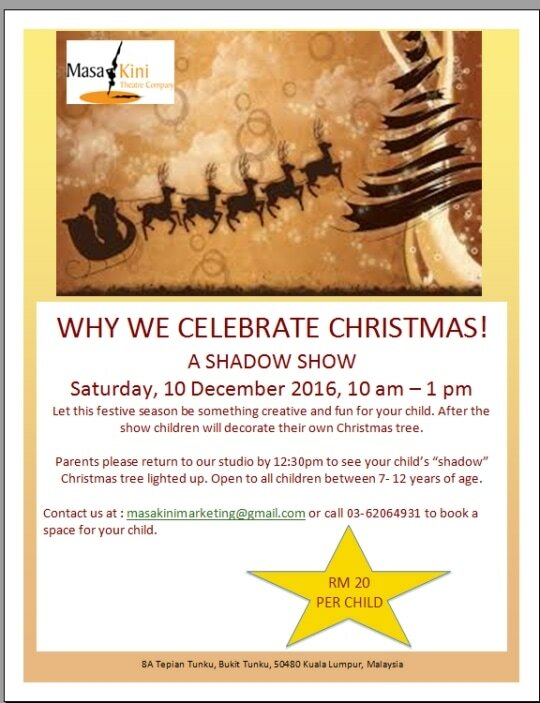 WAYANG FOR KIDS - WHY WE CELEBRATE CHRISTMAS! Send your kids to us from 10am till 12,30pm. They will watch a shadow piece called WHY WE CELEBRATE XMAS for 25 minutes. Send your kids to us from 10am till 12.30pm. They will watch a shadow piece called WHY WE CELEBRATE XMAS for 25 minutes. And then build and decorate their own "Shadow" Christmas tree. Parents MUST arrive at 12.30pm sharp so that your child can light up their Christmas trees for you! Watch the dispersion and refraction of lights that will add some magic to the trees! 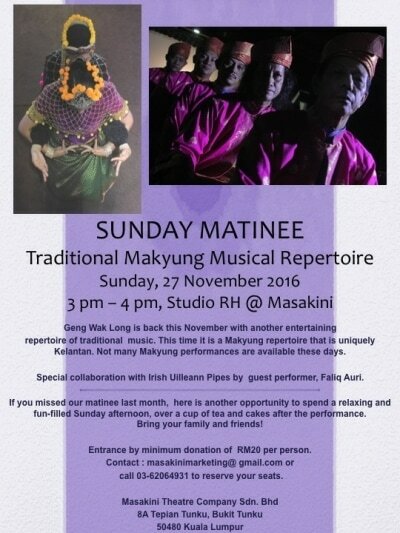 Geng Wak Long is back this November with another entertaining repertoire of traditional music. This time it is a Makyong repertoire that is uniquely Kelantan. Geng Wak Long is back this November with another entertaining repertoire of traditional music. This time it is a Makyong repertoire that is uniquely Kelantan. Not many Makyong performances are available these days. If you missed our matinee last month, here is another opportunity to spend a relaxing and fun-filled Sunday afternoon, over a cup of tea and cakes after the performance. Bring your family and friends! Entrance by donation RM20.00 per person. Come and join us for an exciting afternoon of traditional Kelantanese music by our world reknown GENG WAK LONG with improvisations with well known Japanese musician, JUNICHI USUI who plays the Sho, electric guitar and violin. Do join us for an hour of "craziness" with a cup of tea and cake! 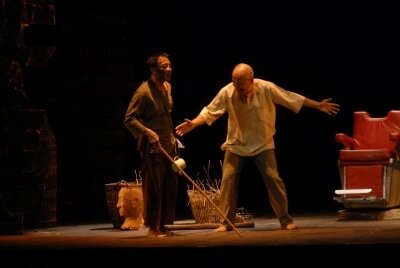 Masakini Theatre Company is presently working to produce a new shadow piece based on our Orang Asli. This yet untitled piece will be special as it will have a special stamp on it - that of Larry Reed's of ShadowLight, USA. Mr. Reed was in Kuala Lumpur from 21st to 28th September speaking with Orang Asli communitites and experts in their music and dance. He visited some communities in Pahang where some song and dance was showcased. The production is targeted for August 2017 and is expected to be very different from Masakini's past works. Elektrisola, who takes a keen interest in the development of the Orang Asli community in Janda Baik, has come on board as one of our sponsors for this project. 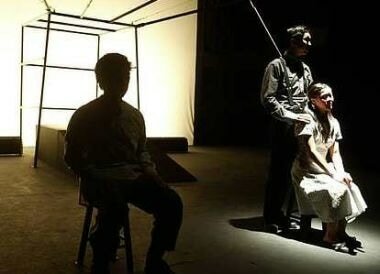 Directed by Sabera Shaik and Chi Azim, WAYANG - MALAYSIA KITA will take you on a nostalgic journey of discovery through Malaysia using light, shadow, projections, music and narration; with the actors using their bodies as the medium for creating the characters and props. 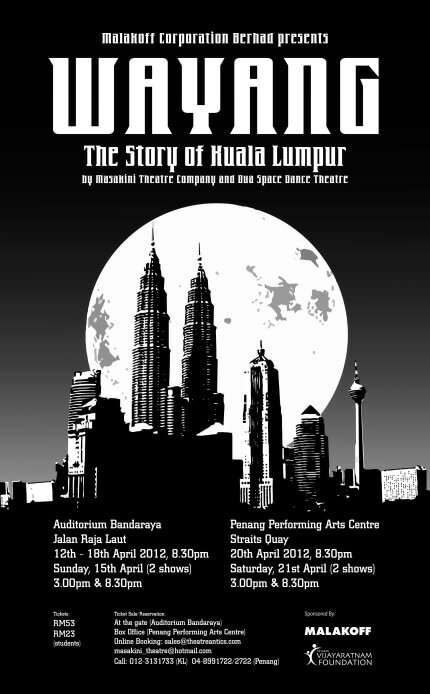 This is a show that will make you remember why you love Malaysia, with a few surprises along the way! Not just dance but a novel way of story telling. 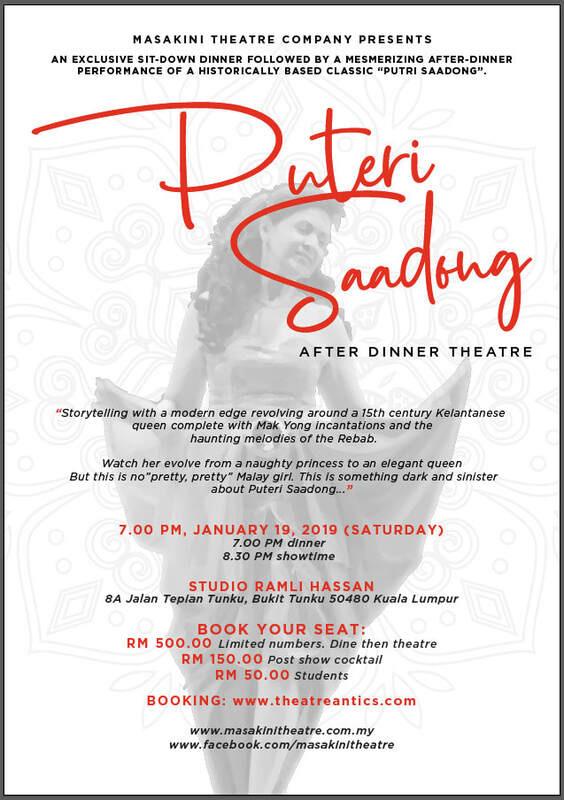 Rajika Puri dances the story of ELENI OF SPARTA, Anita Ratnam is A MILLION SITAS and Sabera Shaik tells the story of the beautiful but dark princess from Kelantan in PUTERI SAADONG. Please contact Masakini Theatre Company Sdn Bhd at 03-2691 0119 or email: masakini7890@gmail.com for enquiries and group booking for 10 tickets and above for each show. 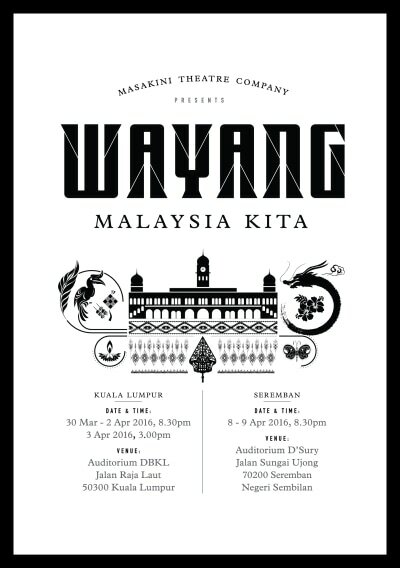 WAYANG - Malaysian StoriesMasakini Theatre Company brings you Wayang - Malaysian Stories. Once again a collection of fine performances by our local performers will not only entertain but amaze you with their unique style of presentation of music, dance/movements and stories. NEVER BEFORE IN MALAYSIA! Opening the night will be Chan Ming Lye, a well-known Malaysian singer who resides in New York, where he works as a singer and actor. Ming Lye was in the famed musical, MISS SAIGON for seven years. Rathimalar, a dancer who needs no introduction, will pair up with Psycusix to astound you with the play of lights. January 7th - 11th 2015 at the Auditorium Bandaraya. Now preparing to tour parts of the country. 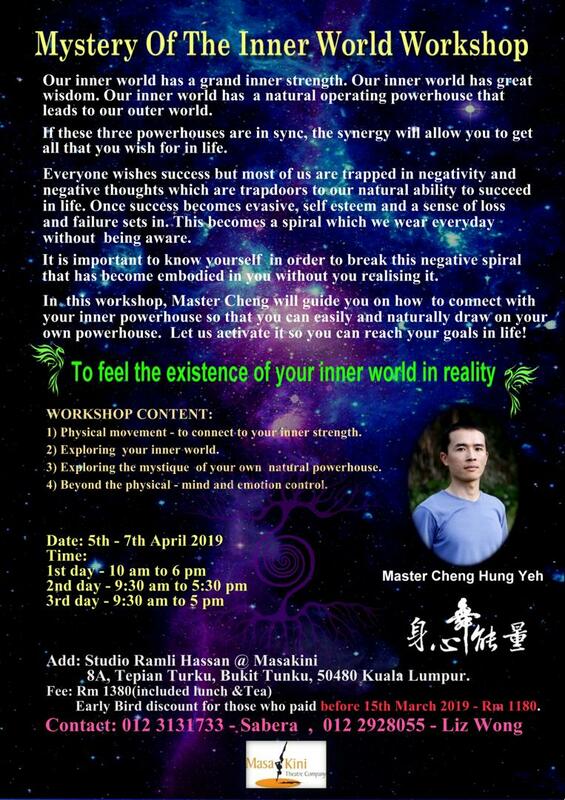 Masakini's Angels descended into Kuala Lumpur to help the Pakinison's Disease Association members and care givers learn ways to move their muscles through dance and rhythm and percussion for 1st May - 5thMay 2014. Rita Superbi, world renown percussionist put members through five fun mornings of making music with the most ordinary household objects. 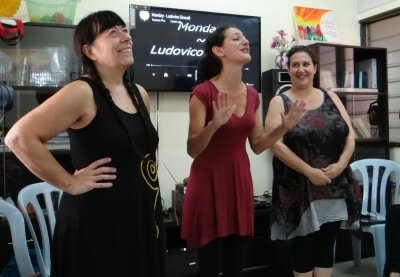 Julia Filippo a dance therapist and actor showed them enjoyable dance moves they found invigorating and not impossible! Before the end of the five days they had more members attending than anticipated. This enjoyable 5- day session has become a talking point as everyone enjoyed themselves tremendously but at the same time learnt ways to get around their disability. Photos show Cinzia Ciaramicoli,Rita Superbi and Julia Filippo working their magic during the sessions. Masakini's Angels are now in Kota Bharu working with the Yayasan Orang Kurang Upaya Kelantan where they are teaching Down's Syndrome and slow learners youths to play the ukulele, make music/percussion and to act. They are in Kota Bharu from 10th Aug till 23rd Aug. On the last day, the groups will showcase what they have learnt in a show during the YOKUK fundraising carnival. 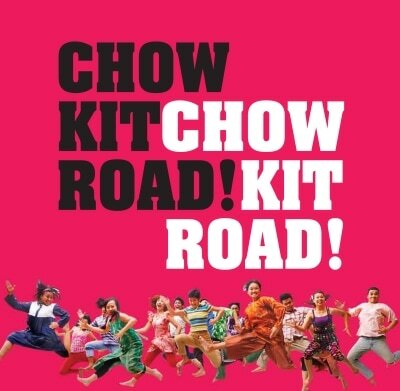 Masakini Theatre Company in collaboration with the Minister of Information, Communications and Culture presents a must watch musical for 2013.....CHOW KIT ROAD! CHOW KIT ROAD! Adibah Noor, Tony Eusoff, Shanthini Venugopal, Junji Delfino, Anding and the next big talent in the music world, Nadia Aqilah. Watch out for these personalities as they sing, dance and gyrate with a powerful ensemble of dancers and singers. Music will be played by musicians from AkashA and friends. It's about a boy (Anding). From Chow Kit Road. His ups and downs. His oohs and ahhs. The Ladies of the Night ( Junji Delfino) the transvestite (Shanthini Venugopal). The druggie (Tony Eusoff), the Datin (Adibah Noor) and her well travelled daughter (Nadia Aqilah). 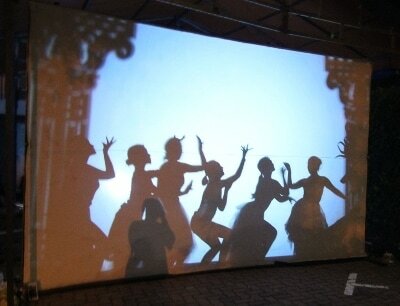 WAYANG..The Story of Kuala Lumpur. Once again Masakini and Dua Space Dance Theatre are collaborating in another piece of shadow theatre with the telling of the history of Kuala Lumpur in entertaining and sometimes hilarious ways. Facts and trivia will mix to make up for an entertaining evening for all. This production is a double bill with last year's WAYANG which will be performed in the second part after a 10 minute intermission. 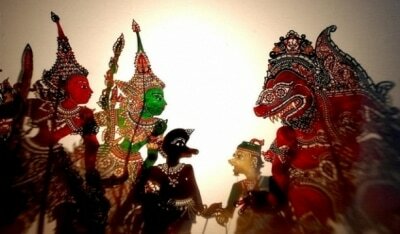 Some parts have been replaced by new and current socio-political issues and so this year's WAYANG does have a new feel. Actors and dancers include>Anthony Meh, Aman Yap, Az'farr Baginda, Chi Azim, Farah Ahmad, Kenny Leow, Howard Hew, Ahmad Ezzat, Little, Nicki, Jiun Yee, Fahad Iman bin Zulhisham. Unbridled jealousy, greed, unquestioning trust - ingredients for murder and suicide. Sounds all too familiar? 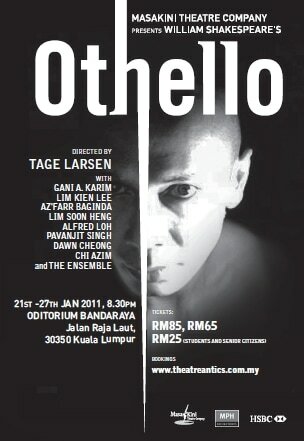 Shakespeare's OTHELLO, with all it's mix of potent human frailties mirroring our times comes to life on our theatre boards this January 2011 from 21st till 27th at the Oditorium Bandaraya, Jln Raja Laut, Kuala Lumpur. The timelessness and relevance of Shakespeare is never more evident in these trying times. 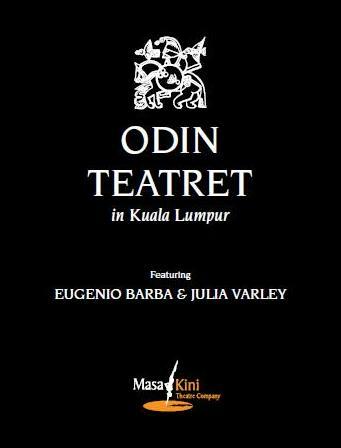 Danish director Tage Larsen from the renown Odin Teatret will be in Kuala Lumpur from 3rd Dec 2010 till 27th January 2011 to direct our actors. 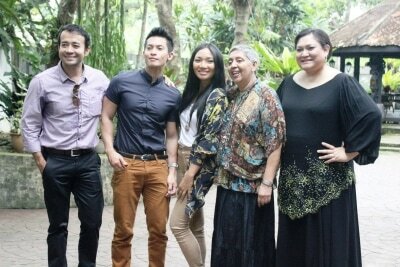 Lim Kien Lee (Iago), Gani Karim (Othello), Dawn Cheong (Emilia), Lim Soon Heng (Brabantio/Gratiano), Az'farr Baginda (Roderigo), Alfred Loh (The Duke/Lodovico) and a host of other characters. Expect Shakespeare out of the ordinary as Mr. Larsen takes the actors and the audience on a journey where jealousy and greed with their twists and turns sweep up the characters into a turbulence beyond their control. 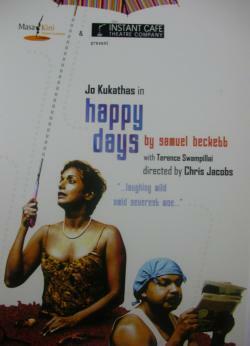 Acted as the CHARLADY in Steven Berkoff's adaptation which was adapted and directed by Chris Jacobs. The play opens with Sydney Swettenham, wife of the Resident General of Malaya and later, Governor of Singapore, reminiscing her youth while in an asylum in London in 1938. She recalls the heady days of the summer of 1877 when she was wooed by Frank Swettenham, their subsequent marriage in February 1878 and arrival in Singapore in May of the same year. Sydney's recollection of her life in Malaya and Singapore and her marital misery do not follow any chronological order. Already 80 years old at the time of her divorce, the fiesty lady pours vitriol on her much respected husband's reputation and the society she found herself in. The young Sydney, while an accomplished pianist and popular in Perak and Selangor for her 'theatricals' is best remembered as the architect of the Taiping Lake Gardens which still stands in its original pristine glory and is still a popular park in Perak today. Visit of Eugenio Barba and Julia Varley to Kuala Lumpur and Penang. 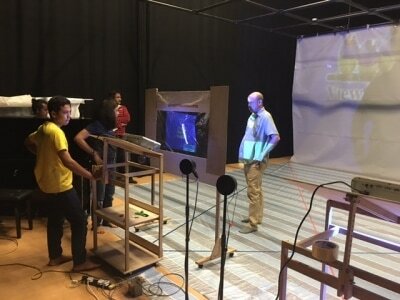 Mr. Barba delivered lectures and Ms Varley conducted work demonstrations at The Kuala Lumpur Performing Arts Centre, ASWARA and Universiti Sains Malaysia, Penang. Fresh from the success of their 24 Hour Theatre Project, Masakini Theatre Company will be presenting Ahmad Yatim in his lead role as Makuri in The Swamp Dwellers, a Nigerian play adapted to a local situation. The play, written by Nobel prize (Literature) winner, Wole Soyinka, examines ingrained traditions, beliefs, religion,life in the kampong and the city but stops short of making a pronouncement on the issues unraveled in the play. Makuri�s twins Along and Budin leave the Swamps for the city yet both boys meet different fates. Budin falls into debt and loses his wife but Along is a successful and wealthy merchant. In a tense scene, Budin questions the role of his priest and egged on by a blind beggar from the North, he insults the visiting priest, much to the chagrin of Makuri. What happens next is up to the audience to conclude. 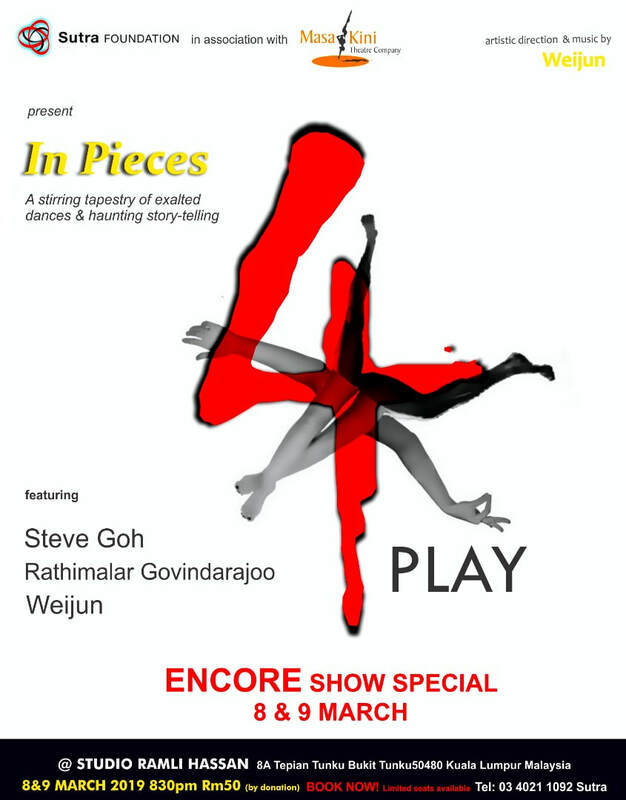 The production includes Lim Soon Heng, Zaifri Husin, Lim Kien Lee and the Tandak Dance Ensemble. 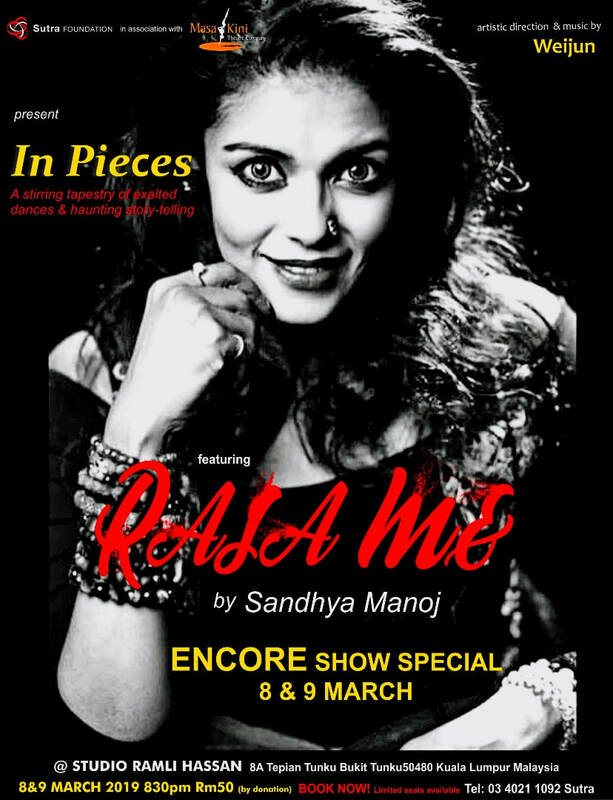 Movement and dance sequence in this one and a half hour show is choreographed by Guna and directed by Sabera Shaik. This will showcase works by new or experienced writers, actors and directors whose talents, experience and imagination will be put to test to put up a 10 - 15 minute play within a span of 24 hours for a paying audience. Prospero a high priest, banished to an island for dabbling too much in the occult, waits for his chance to revenge his exile upon his brother Antonio and Alonso the king of Naples. For 12 years, he and his daughter Miranda have existed on this island with Caliban, a half fish, half human monster whom he keeps as his servant, and Aeriel a lively spirit. Both yearn for their freedom and would do anything to gain it. Prospero's chance at revenge is realized when he comes to know that the ship bearing the king, his brother and courtiers will leave Algiers to return to Italy, after the wedding of the king's daughter. Prospero cooks up a tempest and the shipwreck reaches the island. Through Prospero's machinations with the help of Aeriel, Ferdinand, son of the king of Naples falls in love with Miranda, therefore securing Prospero's position in society; Sebastian the king's brother is prevented from killing him (the king) and usurping the throne; and all are forgiven for their transgressions toward Prospero at the end of the play. Everyone leaves for Italy leaving Caliban and Aeriel who have gained their freedom when Prospero leaves the island. The play, based on Shakespeare's The Tempest, will be set on an island in South East Asia and will be given a Nusantara feel or treatment. Music and costumes will be Malay/Indonesian based. 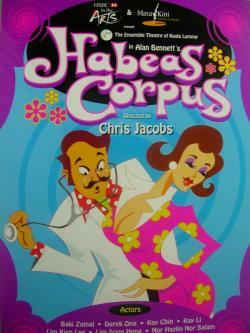 "... laughing wild amid severest woe ..."
Alan Bennett's hilarious play "Habeas Corpus" was a hit with KL Theatre goers. 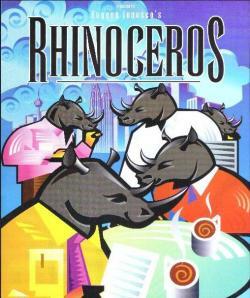 "...laughing wild amid severest woe..."
Ionesco's Rhinoceros - a funny, absurdist play performed in KL's oldest theatre. 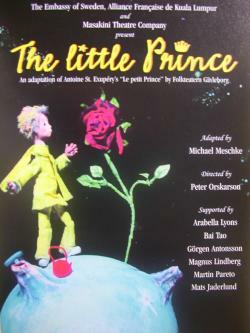 An adaption of Antoine St. Exupery's "Le petit Prince" by Folkteatern Gavleborg. 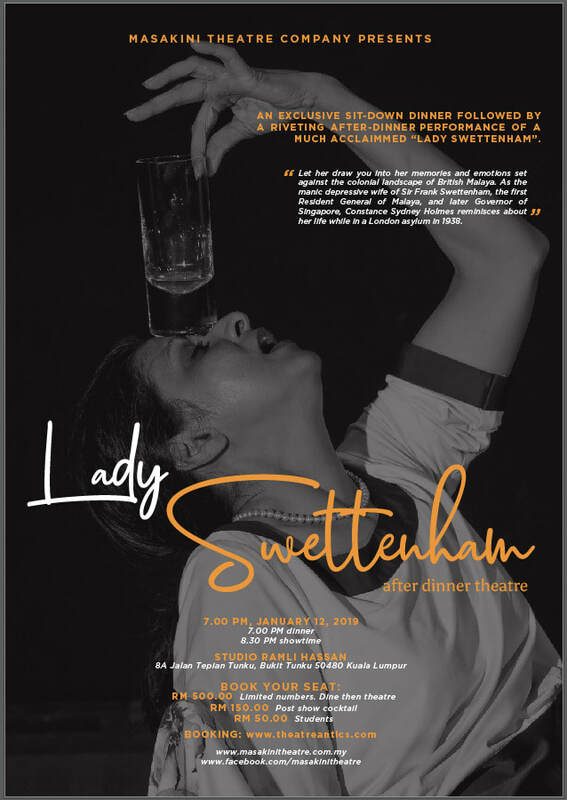 This time she presented Lady Swettenham, a play with many roles done brilliantly by Sabera. The show, which is the result of her attending Eugenio Barba's workshop in the Odin theatre. Odin does excellent work on the physical training of actors with an emphasis on communication on the representative level, of emotions, ideas and ideology. 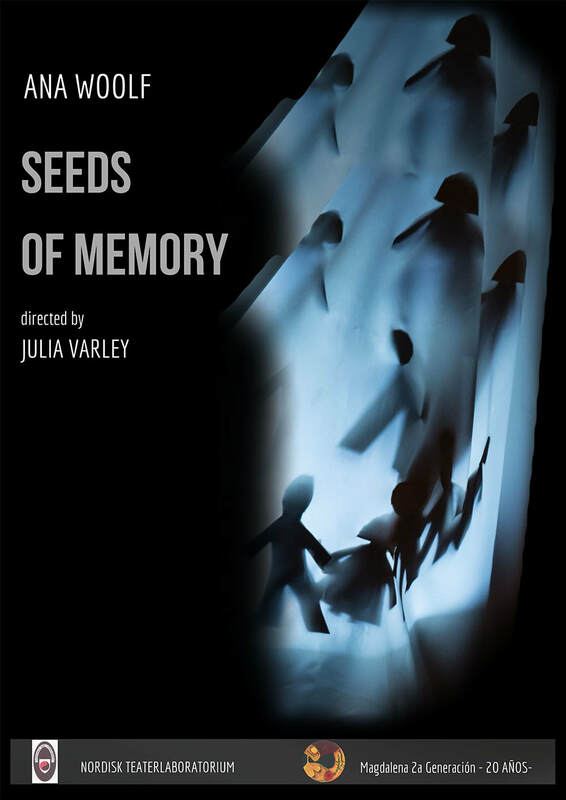 The play is directed by one of Odin theatre's most senior member, Tage Larson on a set devised by him. 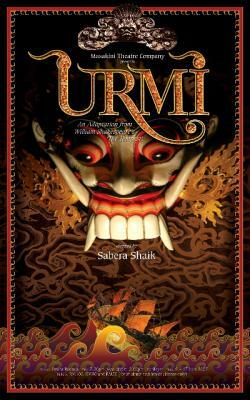 Sabera tells the story of Sydney/Connie, the daughter of a Victorian middle-class family from Shrewsbury England. Her father was a house master till his death in 1887. Altering her body suitably, she portrays him with all his pomposity and his bossy attitude towards the family. The eldest of six siblings, she was closest to her brother Clive, who is enacted here as a dandy full of himself and his new fiancee Sabera is very conscious of voice changes and manages very well with two different male voices. Her home life is not congenial due to her overbearing father and the picture she paints of her fear and boredom is done with an effortless ease. Her marriage to the unattractive Frank Swettenham is an excuse to leave the house. Right from the honeymoon to the point when they leave for Singapore, life is not the heaven Connie imagines it will be. There are reasons for her medical problems later in life. Besides the fact of having had a mentally unstable uncle, it is not difficult to surmise that she proved to be unable to cope with the starchy society of colonial Singapore. And then perhaps subject to irrational outbursts, which no doubt caused embarrassment and sometimes offence to her social acquittance. This is the coup de theatre; When she plays five or six women's reaction to her bad behaviour in the club. Sabera is absolutely hilarious when she imitates, the false soprano tone of one woman, the hand wringing of another, her miming is superb. Besides her capacity to imitate and give meaning to her own state of mind, she also gives life to characters as widely differing as Kasim her servant in Singapore. With one hand she plays Kasim in his straw hat and black pyjamas, thus creating a character out of literally nothing. She speaks to him in English and he speaks an accented English as a foreign language, which she does not understand. This exchange takes place when she is slowly getting drunk on gin. Kasim begs her to stop drinking. He finally takes away the bottle and ice when she is almost out. 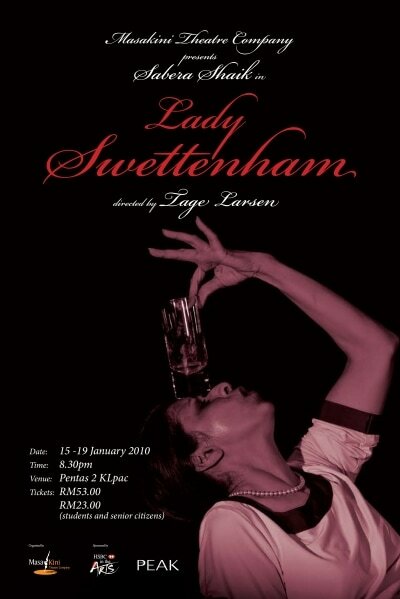 Her secretive drinking is very cleverly shown as she holds her gin bottle between her knees, and pours herself a drink as she speaks with her husband Frank, who has just returned from one of his long absences from Singapore in his job as assistant colonial secretary. She then hides the bottle under the table cloth. The entire play is in flashback as an old Connie relates her story starting as an old woman seated in a wheelchair. After her first nervous breakdown breakdown in 1887, she followed up the disgrace with another catastrophic act, she got pregnant with another man. By this time their marriage was beyond repair. She was packed off to England. She speaks of Frank trying to divorce her. The first time was in 1904. His refusal to return to her led to prolonged mental instability. After eight years in a mental asylum, she was discharged in 1912. She visited Malaya twice after this and both times she was well received. However, her last visit in 1928, due to letter sent by Frank to the governor, Connie was not given a good reception and this led to another breakdown. Her last and final breakdown occurred in 1930. However, she continued to be admitted to Stanley house and died there in 1945 which is where the play ends. Her attempts to get along with old age displays a spirited person who will never stop fighting, even when she receives the divorce decree. The text for the play is adapted from Harold S. Barlow's biographer of Frank Swettenham in which he has painted him as an ambitious, sinister and corrupt man. And further, that part of his wife's instability was due his treatment of her. He dispatched her home in public ignominy in 1984. After failing his first attempt to divorce her in 1904, he had to wait till he was 88 succeed. Frank Swettenham had successful career working in what was then Malaya or the Strait Settlements. He was the chief architect of the Federation, finally becoming the governor-general of Singapore. In his retirement he held several important assignments, including the joint chief censor during WWI. There is no photograph of Sydney/Connie available even in the Strait Settlement archives. It is incredible that Sabera Shaik has managed to create a living picture Connie with the meagre material available to her. The musical revolves around a young student Aishah who dreams of making it big in Bollywood.